Elektro-L No. 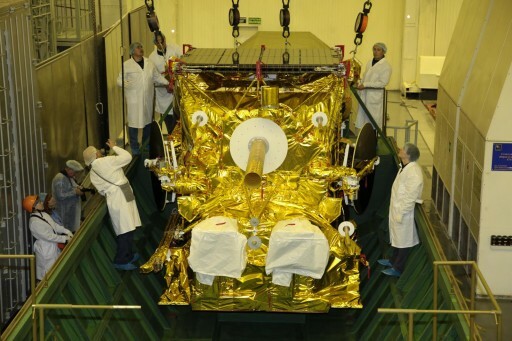 2 is the second satellite in Russia’s second generation of Meteorological Satellites operated from Geostationary Orbit. Outfitted with visible, infrared and microwave imaging payloads plus ocean-monitoring equipment, the satellites deliver critical data used in weather forecasting. 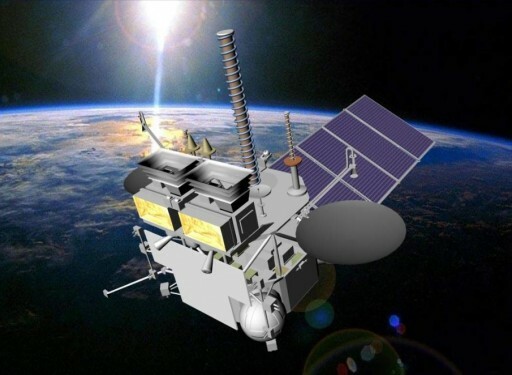 As it is typical for meteorological satellite systems, the Russian Space Agency operates satellites in Sun-Synchronous Orbit for detailed measurements of the atmospheric conditions a few times a day for each location while satellites in Geostationary Orbit deliver a continuous look at weather systems and their development given the full-disk visibility of the GEO satellite. The primary objective of the Elektro-L program is to deliver operational multispectral imagery – hydro-meteorological data of the atmosphere, including the cloud-covered sky and Earth’s surface within the coverage region of the spacecraft. Also part of the mission objectives of Elektro-L is the collection of heliospheric, ionospheric and magnetospheric data, and to provide communications for Data Collection Platform data retrieval and to fulfill Search and Rescue functions. The Elektro-L project finds its origin in the 1980s and plans were made to deliver two satellites to orbit. Economical issues reduced the program to only one spacecraft that was delivered to orbit in 1994. By that point, other nations including the U.S. and Europe were already operating weather satellites in Geostationary Orbit. Elektro continued working until 1998 after which Russia was facing a lengthy gap in weather data from Geostationary Orbit that had to be procured from foreign institutions. The contract for the second generation of Meteorological Satellites was awarded to satellite manufacturer NPO Lavochkin in 2001 under a program managed by Roscosmos for the delivery of data to Planeta (Scientific Research Center of Space Hydrometeorology) and Roshydromet (Federal Service for Hydrometeorology and Environmental Monitoring). 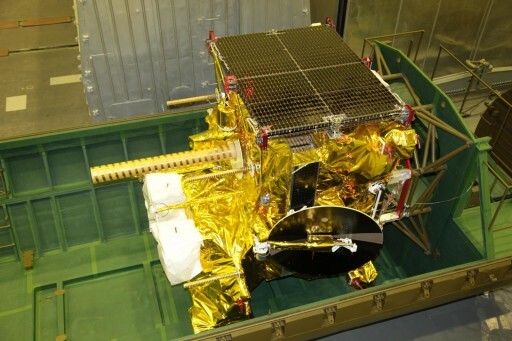 The first Elektro-L satellite was initially targeting a launch date of 2006 which slipped to 2007 and not much later to 2008, but in the second half of 2009 the satellite was still on the ground and awaiting the integration of one of its instruments. 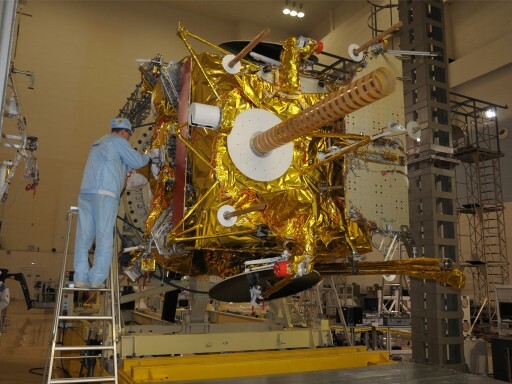 A similar instrument on another satellite showed deficiencies when operating in orbit, requiring additional modifications to be made on Elektro-L #1 and the launch continued to slip into late 2010. Launch processing related delays pushed the launch into 2011. Finally, on January 20, the satellite blasted off atop its Zenit rocket and had a flawless ride to its expected Geostationary Orbit where it underwent commissioning and checkouts before entering service as part of a planned 10-year mission. 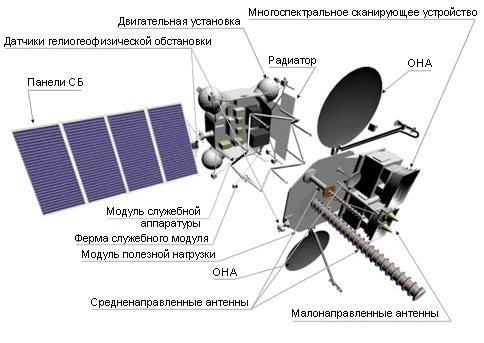 The Elektro-L satellites are based on Lavochkin’s Navigator satellite platform that was developed in the early 2000s to establish a platform suitable for all types of payloads and missions. The satellite was designed not to rely on pressurized compartments which had been the industry standard in previous decades. Navigator can be used for remote sensing, communications and science missions operating anywhere between Sun Synchronous and Geostationary Orbit as well as the Lagrange points. The Navigator platform has a dry mass of 950 Kilograms and can hold up to 540 Kilograms of propellants. It can accommodate payloads weighing over two metric tons. Two deployable solar arrays deliver up to 1,200 Watts of power to the satellite payload using a 27-Volt regulated power bus. Attitude determination is accomplished with a suite of sensors including Star Trackers while attitude actuation uses four reaction wheels creating a pointing accuracy of 0.05 degrees. Propulsion is accomplished with four 5-Newton thrusters for orbital adjustments and eight 0.5N thrusters used for attitude control. The Elektro-L satellite weighs approximately 1,855 Kilograms including 264kg of propellant. 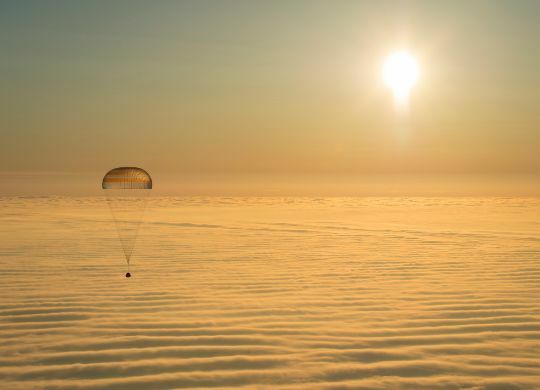 The satellite hosts four instruments for a total of 435kg. 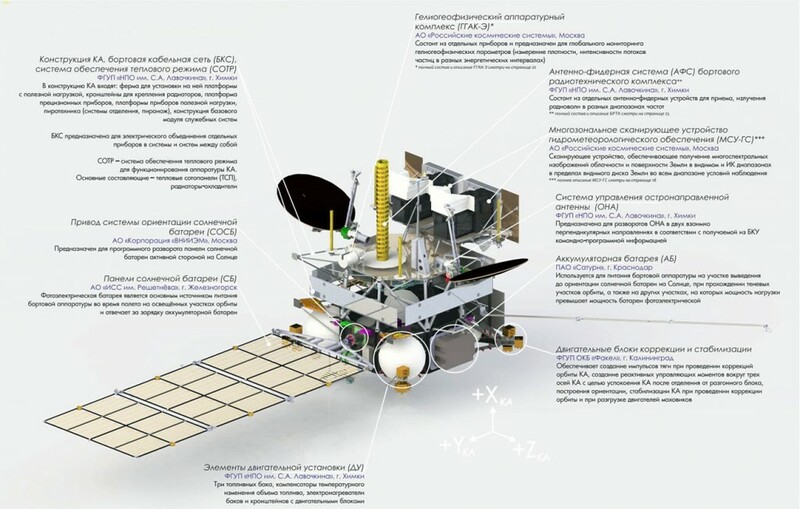 The main instrument of the Elektro-L satellite is MSU-GS, the Multispectral Scanner – Geostationary – a ten-channel radiometer covering the the visible & near infrared spectral range, the thermal infrared and the microwave band. MSU-GS has a mass of 106 Kilograms and requires 150 Watts of power. The instrument obtains solar reflected imagery and brightness temperature readings from the Top of the Atmosphere to Earth’s surface. MSU-GS also measures the tropospheric moisture content. 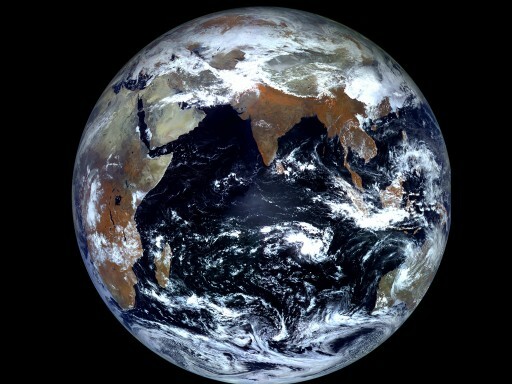 Typically, the instrument collects one full disk image of Earth every 15 to 30 minutes plus one sub-region frame which can be selected as desired. MSU-GS covers three channels in the VNIR spectrum (0.5-0.65, 0.65-0.8, 0.8-0.9 micrometers) at a spectral resolution of 1 Kilometer for cloud cover assessments, four Microwave/Infrared channels (3.5-4.0, 5.7-7.0, 7.5-8.5, 8.2-9.2 micrometers) at spatial resolutions of 1 to 4 Kilometers for nighttime imaging and water vapor measurements, an three Thermal Infrared channels (9.2-10.2, 10.2-11.2, 11.2-12.5 micrometers) at a spatial resolution of 4 Kilometers for Sea Surface Temperature and water vapor measurements. The GGAK-E Heliophysical Instrument Complex on Elektro-L is a suite of space weather sensors designed to measure the particle counts and energy distribution for protons, electrons and alpha particles as well as incoming X-Ray radiation and to measure magnetic field components. Data from the instrument will be used to track and forecast solar activity, monitor radiation and magnetic dynamics in near-Earth space and to perform studies of the magnetosphere, ionosphere and upper atmosphere. GGAK-E is comprised of seven sensors. The SKIF-6 Corpuscular Radiation Spectrometer measures electrons and protons across a broad energy range. For energies of 0.05 to 20 kilo-Electronvolt the instrument collects one measurement per second and delivers an energy spectrum every 10 or 40 seconds depending on the mode of operation. For high-energy particles – electrons between 0.15 to over 1 Mega-Electronvolt and protons from 0.85 to 70 MeV, the instrument collects density flux measurements once every second. The SKL-E Solar Cosmic Ray Spectrometer also measures electrons and proton flux from the sun starting at an energy of 0.2 MeV for electrons and 3.6 to 100 MeV for protons. GALS-E – Detector for Galactic Cosmic Rays – collects proton density flux measurements in three energy channels from 600 to 1,200 MeV. ISP-2M is a dedicated sensor for the measurement for the solar constant. The instrument collects incoming radiation in the broad infrared band covering a wavelength range of 0.2 to 100 micrometers and a dynamic range of 700 to 1,500 Watts per square meter while the VUSS-E solar UV radiation sensor examines the radiation intensity at the characteristic 121.6nm HL line. Solar X-Rays are measured by the DIR-E sensor covering an energy range of 3.0 to 10.0 keV. The magnetometer of the instrument is designated FM-E and measures the three components of the magnetic field vector plus the magnetic field strength. It achieves a relative accuracy of 0.01% and collects 16 field measurements per second. GGAK-E has a mass of around 50 Kilograms and requires a power of 50 Watts. Data from the instruments is collected by a purpose-built Onboard Data Sampling System that stores all data in raw format and completes onboard processing to deliver High and Low-Rate Data Formats. The Elektro-L satellite is equipped with an Onboard Radio Engineering Complex that handles all satellite communications – data transmission from the instruments, telemetry downlink and command uplink, and the collection of data from search and rescue terminals and data collection platforms. The downlink of sensor data uses the X-Band frequency at 7.5GHz operating at data rates of 2.56 to 15.36Mbit/s. Data packets from Data Collection Platforms are sent to the spacecraft at the 400 MHz UHF frequency or relayed to Elektro-L via Low Earth Orbit satellites at 470 MHz. Collected DCP data is downlinked from Elektro-L at the 1.7 GHz S-Band frequency. 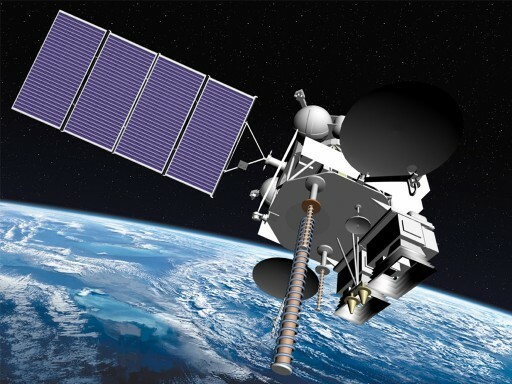 To comply with international meteorological data product formats, Elektro-L employs onboard processing to be able to deliver Low- and High-Rate Data Transmissions at the S-Band frequency for direct reception by customers. The Search and Rescue System, COSPAS/S&RSAT, monitors the 406 MHz frequency for transmissions and distress calls that are relayed in real time to a ground station at 1.54 GHz using a transmit power of 4 Watts.